Esoteric Recordings are pleased to announce the release of a new re-mastered and expanded edition of the legendary album First Utterance by COMUS. Released in February 1971 on Pye Records' progressive rock label Dawn, First Utterance was a darkly stunning masterpiece by COMUS, a group who arguably defy being classified in any genre. Too dark, loud and eccentric to be folk, but too unconventional to be classified as a rock band, the influence of Comus' work extended far beyond their short life. Mikael Akerfeldt of Swedish band Opeth was so enamoured with the band that he named Opeth's 1998 album My Arms, Your Hearse from the lyrics of the Comus song Drip, Drip. Featuring a line-up of Glen Goring (6-string Acoustic Guitar, 12 string Acoustic Guitar, Slide & Electric Guitar, Hand Drums & Vocals), Andy Hellaby (Bass), Colin Pearson (Violin & Viola), Roger Wooton	(Acoustic Guitar, Lead Vocals) Rob Young	(Flute, Oboe & Hand Drums) and Bobbie Watson (Vocals, Percussion), COMUS were regular performers at DAVID BOWIE's Arts Lab in Beckenham, Kent in 1969. 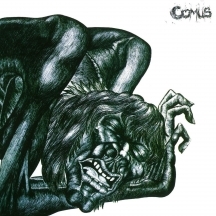 Earning a reputation on the UK college and university live music circuit, COMUS signed to Dawn Records in 1970, releasing the album "First Utterance" and the 'Diana' maxi single in 1971 before falling apart. Their 1971 album later attained a significant cult following and is regarded as one of the most interesting and influential releases on the Dawn label. This expanded and re-mastered reissue includes four bonus tracks taken from the 'Diana' maxi-single, along with the song 'All the Colours of Darkness', recorded during the "First Utterance" sessions. The booklet restores the original album artwork and features an essay by Malcolm Dome and interviews with band members.